This brings back memories of the days of our weekly cooking group featuring Ellie's recipes. I loved those days, making weekly successes and healthier foods. Out group was made up of dedicated and lovely women and I think, we all looked forward to our special time of the week. This week, I happened upon this recipe by Ellie and I knew, it was time that Ellie and I became reacquainted. It was a happy meeting with a yummy dinner. Instead of couscous which hubby can't eat, I subbed in quinoa. Add the chicken and cook about 4 minutes per side, or until cooked through and juices run clear. To the same pan, add the spinach and cook just until wilted, about 1 to 2 minutes. Lower the heat to medium and add the balsamic vinegar and chicken broth to the pan and stir, scraping the bottom of the pan to remove any browned bits. Add the tomatoes, bring to a simmer and cook 3 to 5 minutes. I'm a fan of Ellie Krieger...simple beautiful dishes. 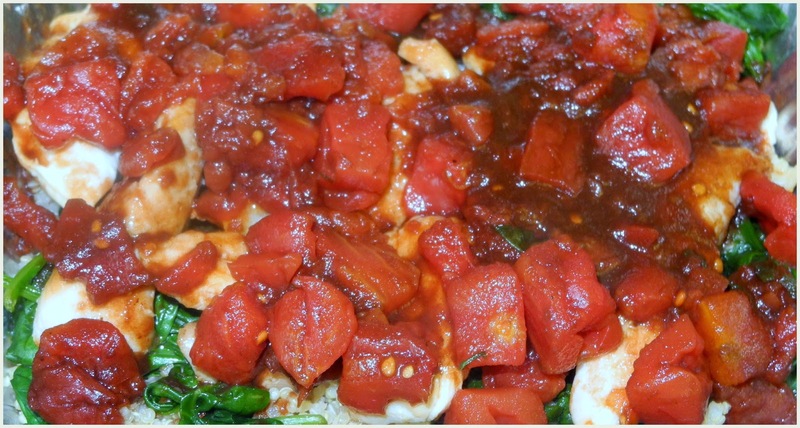 All of the flavors here--balsamic, spinach, tomatoes--work well together. Thank you for linking!